I love stories by writers whose life has been saved by the love of an animal, or two or three. 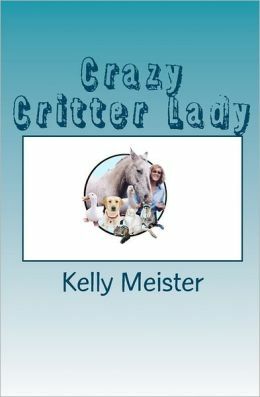 In Crazy Critter Lady, Kelly Meister shares her stories of the animals who share her life: cats, horses, ducks, even birds, chipmunks and helpless mice. In a world where animals are often seen as impediments to progress or expendable pests, Crazy Critter Lady is the story of one woman’s determination to do the right thing for the animals around her. Kelly Meister goes out on a limb – and sometimes a half-frozen pond – to help injured birds, mice and chipmunks, homeless “Aflac” ducks, cranky horses, lost frogs and a host of others. When she’s not chasing squirrels out of the road, the author waits on her five demanding cats hand and foot. Crazy Critter Lady, a memoir, is the story of a love affair with animals. The book takes readers on an emotional roller coaster ride, as Kelly discovers the hitherto-unknown delights of friendship with a band of flightless ducks, deals with Spanky the cat’s low self-esteem, and learns life lessons taught by an aged horse. The author spends money she can’t afford on creatures others are content to leave dying at the side of the road, and risks rabies, drowning, and impromptu amputations in the bargain. But Crazy Critter Lady is more than just a collection of cute and heartwarming animal stories. The author spent much of her life in darkness following childhood abuse, and struggled with depression. She found that the more time she spent around animals, and helping them, the more love and light entered her life. Meister’s stories will make you smile, laugh, cry and nod your head in recognition. Whether it’s a story about Winkie, Kelly’s soul cat who died much too soon, or the story of a neighborhood dog who is virtually ignored by his owners and whose bright moment of each day is Kelly’s visit, Kelly’s interactions with all of the animals in her life will touch your heart. This book is ultimately a testament to the healing power of animals – the author believes that the “critters” helped heal the wounds of her past, and there is no doubt in my mind that this is so. Treat yourself to this wonderful book – you won’t regret it. Kelly Meister is a writer, photographer, and potter. She shares her life with five cats, twelve ducks and a barn full of ornery horses. Meister is also an animal advocate who volunteers at a horse rescue facility. When she’s not rehabbing injured critters, Kelly waits on her cats hand and foot. For more information, visit http://www.CrazyCritterLady.com. I received a copy of this book from the author. Receiving the complimentary copy did not influence my review. I loved the book and I love her. Of course as her fiance, I could be a little bit biased. Really it’s a wonderful book and I highly recommend it!! It IS a wonderful book, Dudley! Thanks for stopping by, and congratulations to the two of you! My pleasure, Kelly – thanks for stopping by! Another book to be added to my TBR pile! Thanks, Ingrid. As you know, I read the book and LOVED it! Wonderful review!